Known for crafting a brand of subtle, musical techno, John Tejada's recorded output ranges across tempo and genre lines, from chilled out affairs with spacious arrangements to pulsating, densely layered, deeply energetic tracks that work magnificently in the hands of DJs as well as on the home stereo. Earlier on, his music found release on labels such as A13, Multiplex and Generation R&S. Following on to those successes, he established his own imprint, Palette, in Los Angeles, in 1996, and has enjoyed seven years of steady growth and recognition. The label has served as an exclusive outlet for his own prodigious output but has recently begun to expand its roster. 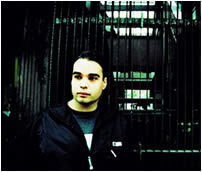 He has also continued to record for other labels such as Plug Research, 7th City, Moods and Grooves, deFocus, Sino and others, often in collaboration with 12 year long collaborator Arian Leviste, and alongside these numerous singles, has also produced eight albums; two for A13, Palette and one each for deFocus, Plug Research, Moods and Grooves and Playhouse. Just posted, a new John Tejada mix to download.